Jordan Spieth will defend his Open title at Carnoustie in July. 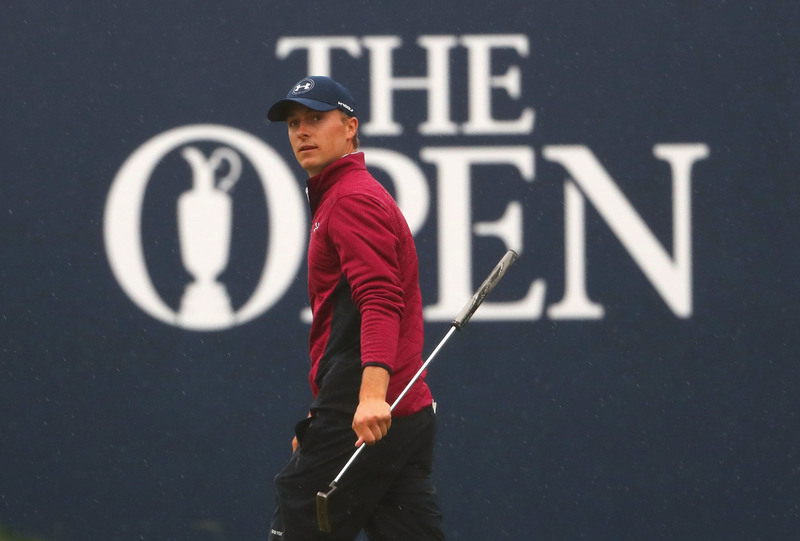 Jordan Spieth has a two-shot lead going into the weekend at the 146th Open Championship after a soggy day of swirling winds at Royal Birkdale. The 23-year-old from Texas, with two major championship victories in his short career from 2015, shot a one-under 69 for a six-under halfway total of 134 despite difficult conditions of driving rain and strong winds. That leaves him two shots ahead of compatriot Matt Kuchar, and three ahead of home hope Ian Poulter and US Open champion Brooks Koepka. Scot Richie Ramsay is another shot off the lead on two-under, with Rory McIlroy not far away after one of the best rounds of the day continued his sudden change in form. Spieth unconvincingly claimed that he had been fortunate to avoid the worst of the weather, citing a momentary drop in wind speed and a small rain delay as the key to his day. The young Texan had a real chance of the Claret Jug in the 2015 Open when he came in having won the Masters and US Open that year only to miss the plkay-off won by Zach Johnson by a single shot. He’s in prime position to make amends this weekend.